One of ECCA’s core competencies is facilitating strategic planning retreats for the leadership teams of organizations. The value of such retreats are generally enhanced by sufficient pre-work and skilled facilitation which assumes responsibility for the group process, leaving the leadership free to fully engage in the strategic conversations which can lead to breakthrough thinking. ECCA professionals have a wide range of experience facilitating planning and team building meetings and retreats. These range from on-site and off-site meetings for leadership teams from The Smithsonian Institution to university departments to non-profit associations to political offices and start-up companies. Our process includes data gathering form a wide range of participants to ensure that the retreat design is addressing the group’s true needs. We conclude these day-long and multi-day meetings by creating action plans for implementation of the ideas generated and processes for tracking progress and results. This work at times includes designing and facilitating sessions internationally for organizations supporting democracy growth or even for the political leadership of emerging democracies themselves. 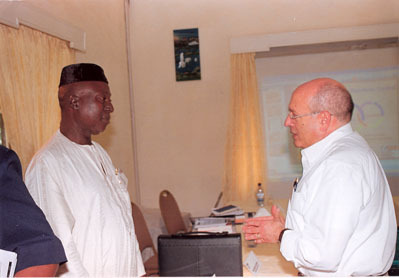 Ira Chaleff was asked to design and conduct a strategic planning retreat for the leadership of the Senate of Nigeria which was held on February 3rd and 4th of 2001. The leaders and/or deputy leaders of the three major parties were present as well as several key committee chairmen. The retreat was sponsored by the National Democratic Institute which is deeply involved in helping Nigerians develop their democratic institutions after many years of living under military government. To develop the foundation of a shared vision, mission and values on which to build a strategic plan that has the passionate commitment and support of the Senate Leadership. To identify mission-critical goals which the Leadership will proactively pursue for the balance of their term, and the processes for successfully implementing them. To provide an experience of strategic planning which the participants can transfer to their other roles as party leaders and heads of their individual Senate offices. To prepare the Senate Leadership for leading the full Senate Retreat the following week and maximizing the opportunity to win the strong support of their colleagues for their strategy to develop the institution and strengthen Nigerian democracy. While political parties inherently vie with each other for power within a legislature, the Nigerian Senators demonstrated an impressive commitment to working together to strengthen their democratic institutions. In a country of one hundred million citizens, in which ethnic and regional differences threaten the cohesion of the nation, National Unity emerged as the single most shared value to guide the political and policy choices the Senators would need to make during the remaining two years of their term. The other widely shared values which emerged were Justice and Fairness, Fear of God (which I interpret to mean accountability to God), Service, Accountability and Transparency, to which the Senators individually, and collectively, committed themselves. Six goals were drafted to form the core of the institution strengthening effort over the next two years, for discussion, modification and ratification at the full Senate retreat. The goals covered the issues of Institutional Development and Independence, Leadership Process, Budget Process, Intra and InterParty and Executive Relations, Committee System and Public Education on the legislative process. A similar, scaled-down version of the planning retreat was also held for the leadership of the House of Representatives. There was similar enthusiastic response to the tools offered them to help form a unified vision and plan. In February 2004, Ira returned to Nigeria to help facilitate another retreat under the auspices of the National Democratic Institute for the full Senate of the National Assembly following the elections of 2003. This four-day retreat was attended by 102 of the 109 members of the Senate. It resulted in a communique outlining its resolutions for strengthening the workings of the Senate in the performance of its legislative duties. An implementation process has been established and will be closely monitored to ensure maximum benefit is derived from the excellent work that was done at the retreat. The approach and processes used by ECCA in facilitating strategic planning are always adapted to the unique needs of the organization, its prior experiences, culture, governance structures, resources and preferences. When there is sufficient commitment to the process by an organization’s leadership, the group emerges not just with a written document, but with a “living” shared vision and set of values that the leadership team uses continuously to guide the organization. 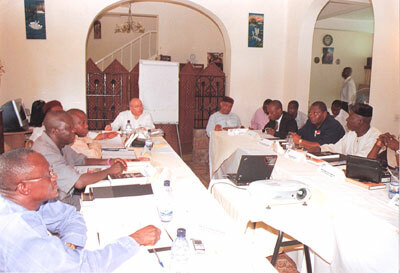 In June, 2008, Ira Chaleff traveled to Sierra Leone to co-facilitate a Leadership Development and Planning Seminar for the leaders of the 3 political parties in the Sierra Leone parliament. 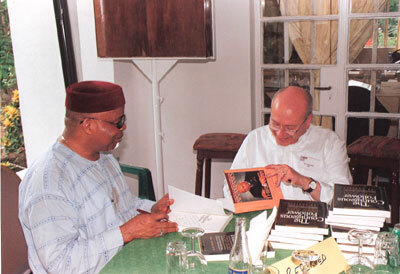 His co-facilitator was Ken Nnamani, former president of the Senate of Nigeria. Senator Nnamani and he autographed copies of their books for the parliamentary leaders. The retreat focused on clarifying the roles of parliamentary leaders and the processes for maximizing collaboration across party lines. Mutually agreeable goals were identified for the leaders to bring back to their party membership as a step towards increased collaboration and parliamentary effectiveness.